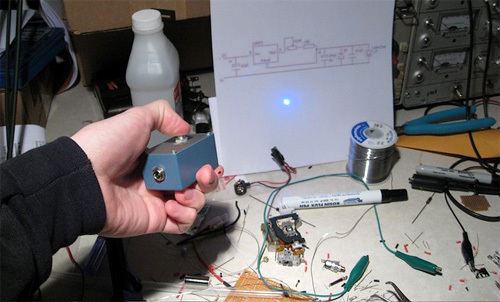 DIY Blue Laser Pointer Using PS3 Replacement Parts | OhGizmo! Thanks to dropping prices and increased availability, green laser pointers are becoming more and more common. As a result you no longer feel like a member of the ‘tech-elite’ when you pull one out. So the only solution to that problem is to upgrade to a blue laser pointer. Unfortunately if you decide to pick one up from Wicked Lasers you’ll be spending almost $1,700. Sure that price will eventually drop, but if you must have one right now here’s a brief tutorial by Joey Hagedorn on building your own that’s surprisingly cost-effective. The key to this project is finding a Sony KES-400a replacement Blu-Ray drive module for the PlayStation 3 console. Thankfully there seems to be a few available on eBay right now, ranging in price from just $39.99 up to around $54.99. Of course there are other items you’ll need like a housing, a PCB breadboard and even a 650nm 5mw 12X30mm laser module, but overall you will save quite a bit of money by building it yourself. While the homebrew laser’s performance might not be as impressive as the version Wicked Lasers sells, it still produces a bright blue dot that can cause eye strain, and the beam is actually visible in a dark room.